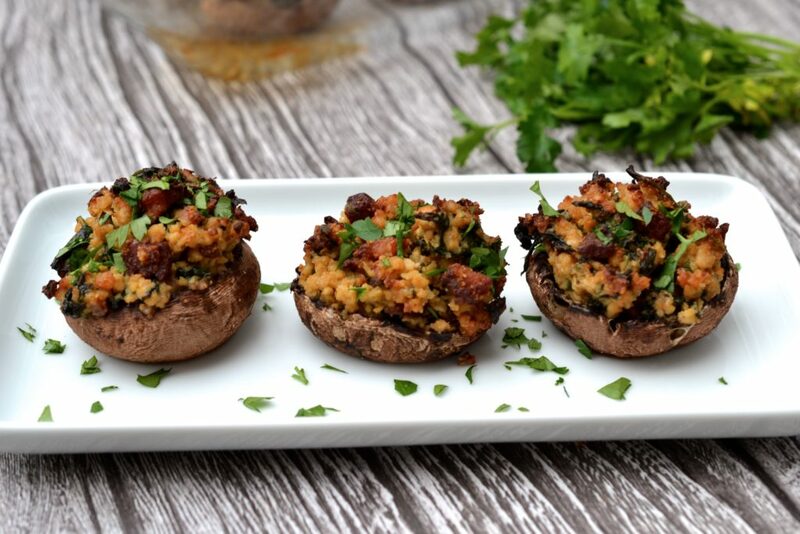 I absolutely love the versatility of stuffed mushrooms. 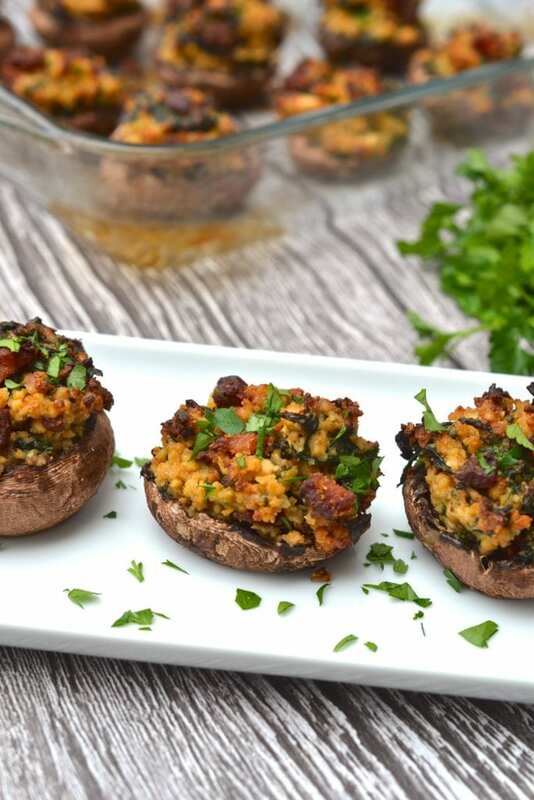 They can be served as a bite sized appetiser or as a hearty side dish and you can fill them with anything from herbs and cheese to seafood, vegetables or meat. 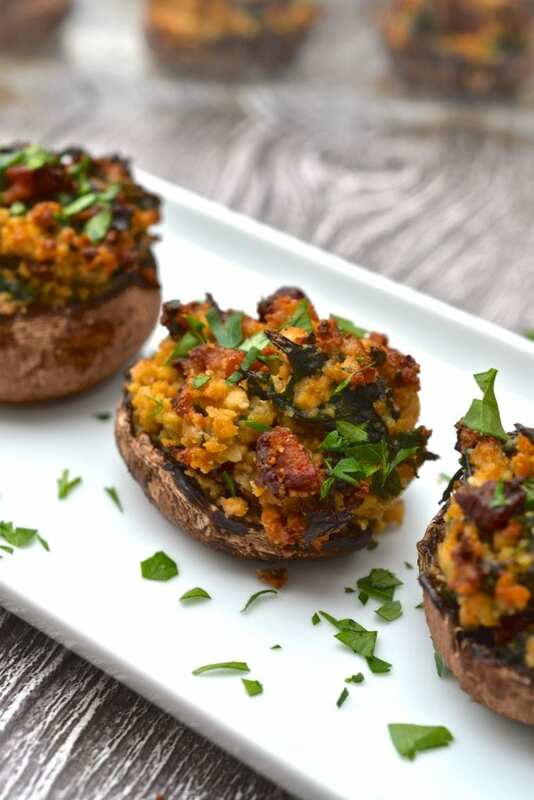 In this recipe the mushroom caps are filled with ground turkey, spinach, kale and parsley and then topped with crisp pancetta because, let’s be honest, everything tastes better when topped with glorified bacon bits. 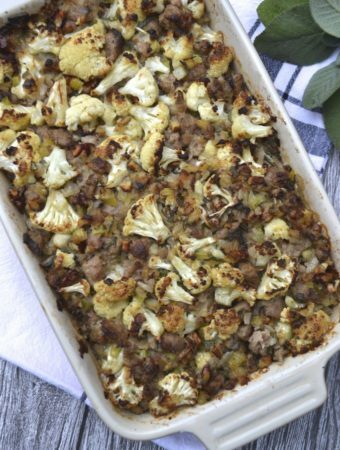 Turkey is very lean and has a low cholesterol and fat content so I like to use it in place of other minced meats, but feel free to swap the turkey for ground chicken or pork. 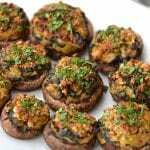 To save time you can prepare the filling and stuff the mushrooms a day in advance and then quickly bake for 25 minutes before serving. Preheat the oven to 175 degrees Celsius (350 degrees Fahrenheit) and line a baking sheet with tin foil. Clean the mushrooms and remove the stems. 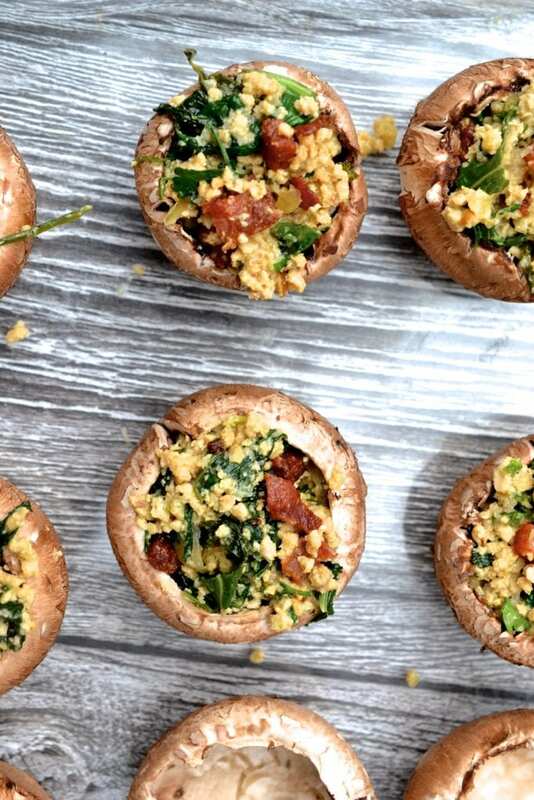 Using a spoon, gently clean out the darker gills from the inside of each mushroom cap. In a pan on medium heat cook the diced pancetta until crisp. Once cooked remove the pancetta and set aside, leaving the grease in the pan. Add in the garlic and onion and cook for 3-4 minutes until the onion becomes translucent then add in the ground turkey and cook for approximately 5 minutes until no longer pink in colour. At this point I like to transfer the meat and onion mixture to the food processor and quickly pulse to break the meat into a finer mince, alternatively you can pour it onto a cutting pour and roughly chop with a knife so that there are no larger pieces. Skipping this step will not impact the overall flavour, I just prefer the meat in a finer mince. 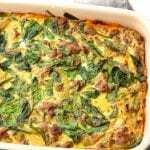 Return the mixture to the pan and stir in the shredded kale, spinach, coconut cream, parsley, pancetta and almond flour. Stir until well combined and season with salt and pepper. Stuff each mushroom with the mixture and place on the baking sheet. 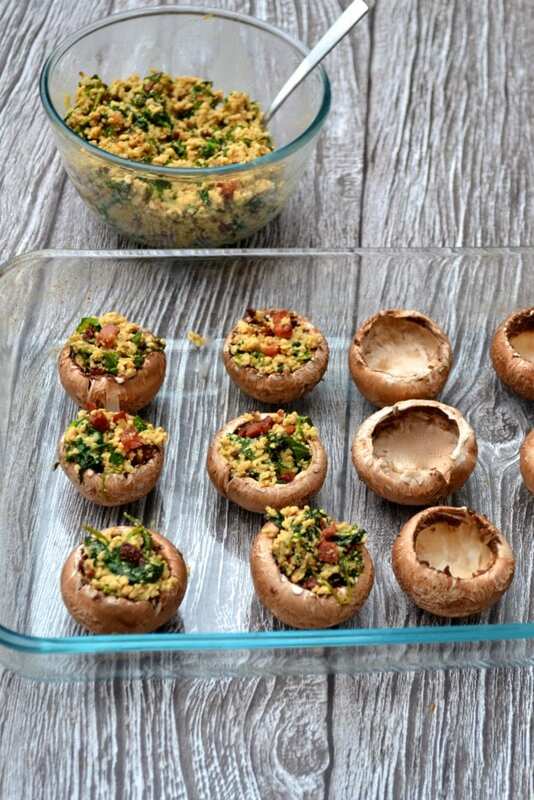 Bake for 20-25 minutes until the mushrooms are soft. 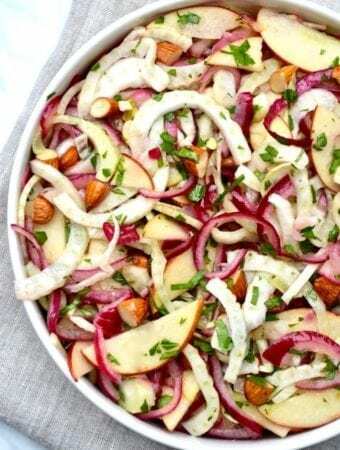 Sprinkle with more chopped parsley before serving. 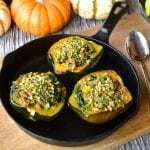 This recipe sounds delicious! 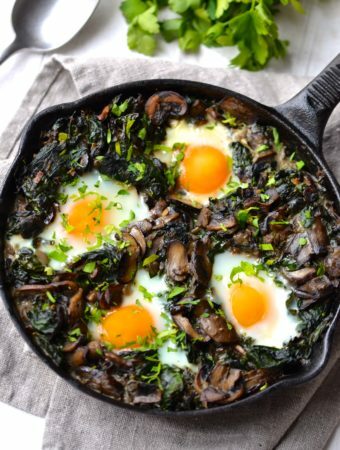 This may be a silly question, but I’m assuming the spinach in this recipe is chopped? 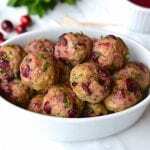 Thinking of making these for Thanksgiving appetizer! Mmmmm! I would give it a quick rough chop but its not completely necessary. So happy that you enjoyed them! And I totally agree, the leftovers are just as good a few days later! Ohhh, these were so good! 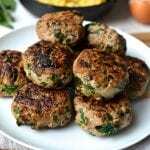 I made them with ground pork, herbes de provence, and a tiny bit of grated parmesan on top. They are delicious! 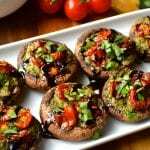 I plan on making them again with large portobello mushrooms for a meal. 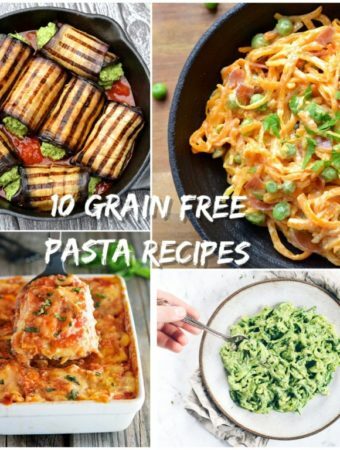 Thank you for these great tasty recipes! I’m so happy that you enjoyed these! 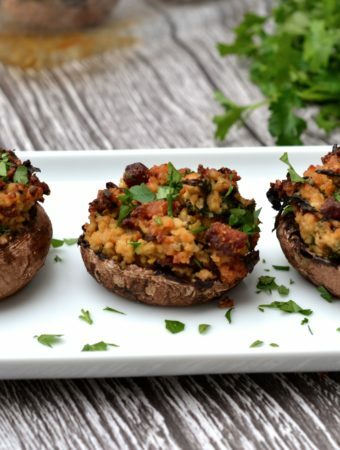 That is a great idea to use portobello mushrooms to turn it into a main dish, such an easy weeknight dinner. Thank you for leaving such a kind comment! 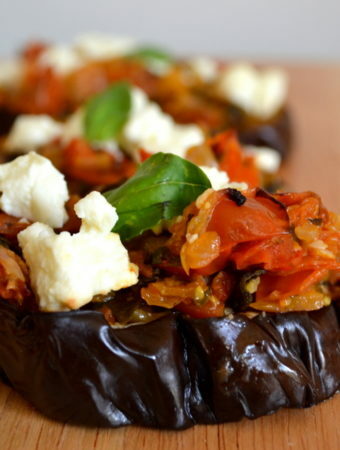 What a tasty side dish (or appetizer) – really enjoyed these. Have a new option for using up Christmas Turkey!